My beloved golden-domed Kiev with its cobbled streets and laid-back people will never be the same. We used to enjoy a slow, Mediterranean-style routine of cafes and gossip. Muscovites treated our city like a resort. These days the city centre is a war zone. It all changed at 4am on December 1 when riot police beat up peaceful demonstrators on the main square, the Maidan. They were mostly students protesting against President Viktor Yanukovych's decision not to sign a planned Association Agreement with the EU. Not that Ukrainians were happy before -- the economy was captured by three business clans and corruption was everywhere -- but this was the last straw. Hundreds of thousands took to the streets the next day to demand punishment for the police. Many erected tents and stayed. A friend, the owner of an advertising agency, became head of a platoon of self-defence militia. Protests turned violent after two months when Yanukovych and his faction responded with new laws that effectively banned freedom of assembly, freedom of speech and even the right to wear helmets to protect one's head from police batons. The new legislation promised prison terms to about 100,000 people in Kiev alone. Among the protesters the radical wing prevailed and Molotov cocktails flew at the police. In response, Yanukovych unleashed mobs with hammers, knives and baseball bats to attack demonstrators and regular citizens at night and discredit the protest. The police did not interfere. It was a tactic reminiscent of Latin American juntas. A colleague at Korrespondent, the magazine where I used to work, Vitaly Portnikov, fled the country after he received threats that he would be 'the next Gongadze', referring to a journalist whose body was found in a forest in 2003. Igor Lutsenko, a civil activist and business editor at the magazine, was kidnapped along with another man. The next day he was on TV -- in a wheelchair with his face bruised. It turned out that he was taken to the woods by men dressed as civilians but behaving like police. He was tortured but survived. The other man did not. His naked body was found a day later. It was obviously done by gangsters or police, or an alliance of the two. As I write, various types of compromise are being brokered. Even to Yanukovych's entourage of wealthy businessmen it is becoming clear that five people dead, 30 missing and 300 in prison may be too high a price to pay for their privileges. They want to buy property in London, not Almaty, and spend weekends in Sardinia, not in Minsk. They are exerting cautious pressure on the key man. I don't know when and how we will get out of this mess. In a month or two my beloved city may get back to its old routine. But it will never be the same. For too long it has been home to so many people who were ready for anything. 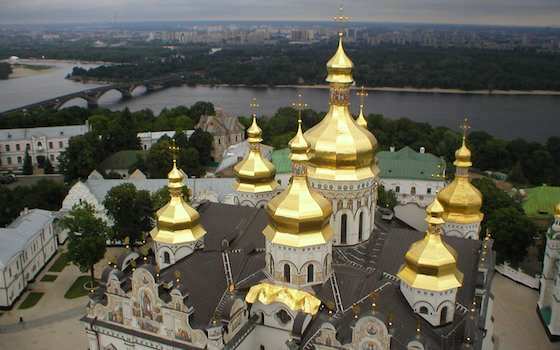 "Ukraine: Beautiful Kiev has been Brutalized"